Another month has been and gone and now we're finally in Autumn, my favourite season ever! 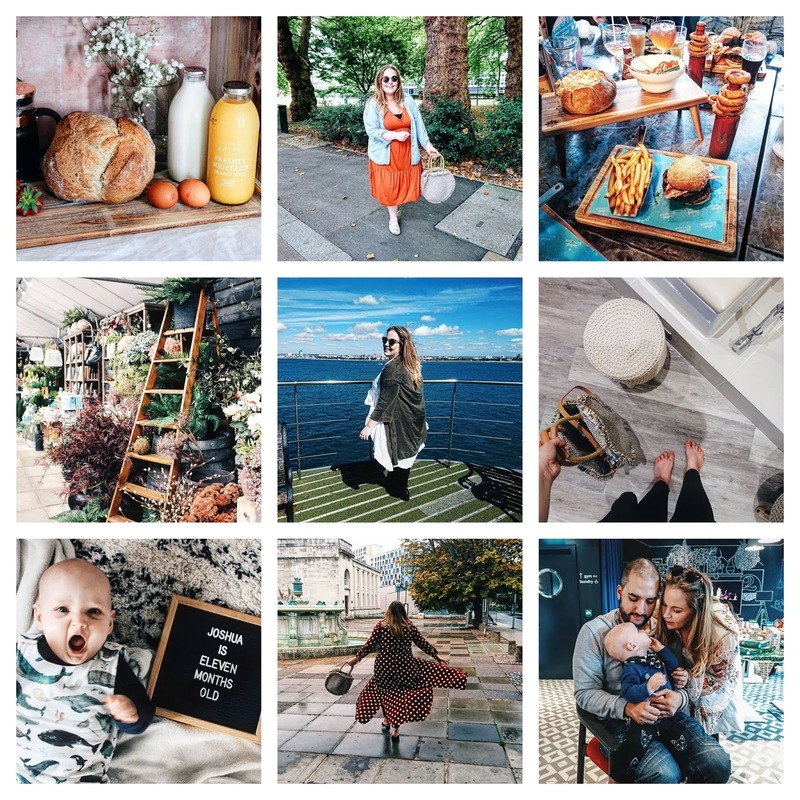 As I've said before my Instagram round ups are my least popular posts and they don't get many views at all but I love them and having a record of what I shared each month. So with that in mind, I'm going to continue sharing them, mostly for me. If you ever want to have a nose at some more then I've added an Instagram Round Up tab to the categories above. Now for September 2018 and what a month! I don't usually mention collaborations or paid work on Instagram in my round up posts but I'm bursting with pride because September has been my biggest month ever for collaborations on Instagram with some of my favourite brands. I feel so lucky and proud that my hard work has paid off and being able to call this my job and spend my time with my son really is the best thing in the world. September has still been pretty warm so I've been prolonging the summer wear just that little bit longer before I have a spend up in Zara for my Autumn wardrobe. Food Glorious Food! We've had so many foodie events with Southampton Bloggers this month with new restaurant openings, menu launches and more so it's been a food heavy month. YUM! I finally visited The Garden Society and it did not disappoint. Mum, Joshua and I spent hours there wanting to buy everything and eating pancakes. It was such a lovely day. I spent an incredible day with Solent Forts across all three forts set in the solent. I've always wanted to visit the forts and it was an unforgettable experience and we had the best day with incredible weather. I took some time for myself and booked in for some beauty treatments and in October I'm heading back for more nail treatments and to have my brows tinted. Joshua turned eleven months old so we are now on countdown to the big O N E! Autumn is here and I'm so excited, it's my favourite season. My favourite family photo ever taken at Southampton Blogger's Macmillan Coffee Morning. I've been loving seeing more of you on your feed recently, I love your style, and I of course love the photos of Joshua too - he is SO cute! The Garden Society looks beautiful! Some of your collaborations in September were insane!! I’ve been loving your content! Congrats on the collaborations! That's greta news. The family photo is so cute! & a big hurray to collaborations! Yay for it being autumn!! Well done on so many amazing collabs!! Well done on your collabs! and happy birthday to your little boy next month! looking forward to hearing your october updates. Girllllll, celebrate those collabs! GET THAT DOLLA!